A thought-provoking textbook written for students enrolled in graduate Higher Education and Student Affairs Masters and PhD programs, College Organization and Professional Development focuses on the framing of critical issues in organization practice, the gaps between moral beliefs and actions, and improving equity within organizations. This breakthrough text seeks to revolutionize how we understand ethical practice and provides a new theory that informs practice within organizations. Unlike the majority of Organization textbooks currently available which lack social contextual understanding of moral issues and social justice, this text encourages the use of action research to inform and support change in professional practice. Students will find the pedagogical exercises useful for reflecting on their own goals, examining their own practices, and testing new intervention methods within their organizations and communities of practice. Reflective assignments are suggested for readers to help them engage in a process of reflective analysis of professional practice. Part I: Focuses on the foundations for moral reasoning in practice, introduces the framework used in the book and encourages introspection and reflection as an integral part of professional practice. 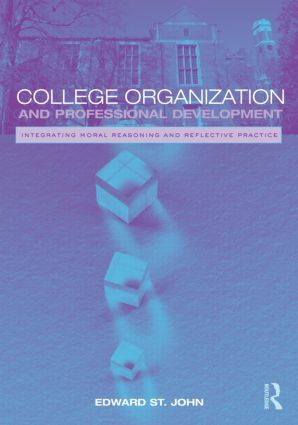 Part II: Focuses on frames of professional development, both as frames of reasoning and as developmental pathways, focusing methods of learning moral reasoning and changing organizations that support just practice. Part III: Focuses on challenges of building communities of practice that support social-critical changes and environmental consciousness. Practicing professionals and those academics at different stages in their careers who wish to reflect on the gaps between their moral values and their actions in work situations will also find this text informative and useful. The chapters include fundamental and insightful guidance for reflection on the topics raised and discussed.